The Paolina hut (Paolinahütte) is situated at the foot of the Rosengarten- or Catinaccio as the Italian call it - above the village of Karersee/Carezza at the top station of the Paolina chairlift. 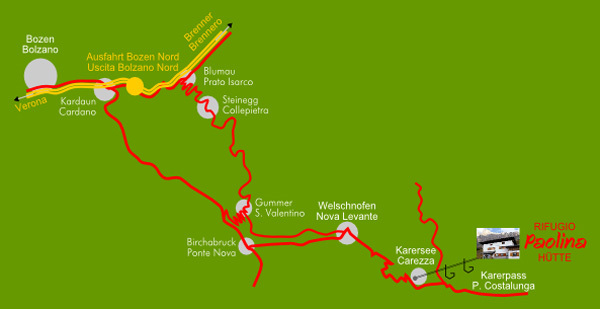 The hut can be reached through comfortable hiking paths starting from Passo Costalunga or the road which takes to Nigerpass/Passo Nigra. The hut was built in 1954 by Sepp and Anna Pichler. 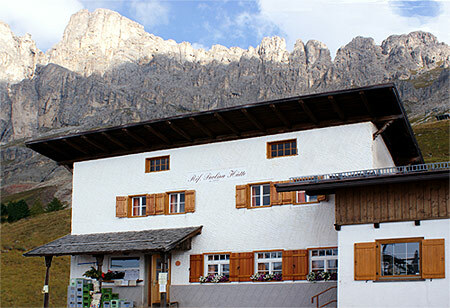 Since 1978 the hut has been run by their son Hermann. In the 1980s the hut was extended and a new dining room was built. In 2009 the hut was connected to the power grid. In the autunn 2011 the old dining room was renovated.